Now that you have found ideal job listings and submitted your resume and targeted cover letter to each listing, it is time to think about the next stage of the job search process: the interview. To make a strong first impression on the employer, you need to be dressed appropriately for your job interview. Today, you will use the following tips to select the perfect interview outfit. Select the Right Colors: The right colors can help convey your confidence, professionalism and your ability to fit into an organization's environment. 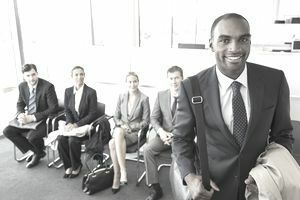 The goal is for the employer not to remember your attire, but instead, to remember your skills and qualifications. Neutral solid colors help keep the focus on you rather than your outfit. Navy, gray, black, brown and black are typically the best colors for an interview. A small pop of color is appropriate, such as a pale blue blouse under a dark suit, or a red tie. However, limit the brightly colored item to one small piece. Select Solids Over Patterns: To keep the employer’s attention on you, not your clothes, you should also choose solid colors over patterns. Small patterns, like thin pinstripes or a checkered shirt, are fine. However, you want to select a pattern that is small enough that it looks like a solid from across the room. Keep It Simple: Keep your outfit simple – a blouse and pants, a suit and tie, a dress suit or khakis and a button-down shirt. Do not add too many accessories. You might wear a scarf or one piece of jewelry, but any more than that can be distracting to the employer. You also want to keep your makeup and perfume simple and limited (no distracting smells!). Know the Office Culture: Despite all of these tips, you should always choose an outfit that fits in with the company’s culture. In a more conservative office, you should definitely stick to a suit or dress in solid, neutral colors. However, in a more casual office (such as a startup), you might be able to wear a bit more color, or pants and a button-down shirt instead of a suit. Before your interview, research the company’s work environment to get an idea of the type of outfit you should wear. However, if you have any doubts about what you should wear, dress on the more conservative side to be safe. Be Ready: Make sure you have an interview outfit well before your interview. Try on the outfit at least a week ahead of time, so you have time to make any adjustments to the fit. Lay out your outfit the night before, and make sure everything is clean and wrinkle-free. This will help you to avoid any last-minute panic about your outfit. You can read more tips on what to wear to an interview, including interview attire for men and women, androgynous attire and other job interview outfit ideas.